A significant contribution to the understanding and application of humor and/or laughter over an entire career with a definable body of work through one or more of the following: speaking, teaching/training, research, publications, and professional practice. 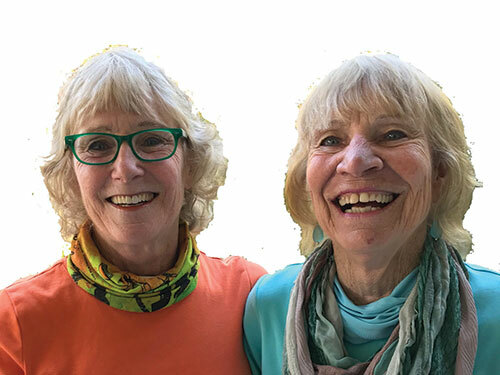 Laurie Young and Kay Caskeybegan their journey into the world of laughter and humor with their final project in their Holistic Health Specialty program at the University of Western Michigan. Inspired by Norman Cousins, and after a year of reading as much literature as they could find on laughter and health, they were hooked. They presented their literature review at the International Society for Humor Studies (ISHS) Conference in 1988 and continued to attend and present at ISHS for years to come. As requests for their presentations mushroomed, they formed “Laughter Works,” with its worldwide headquarters in Decatur, Michigan. During their journey, they discovered AATH and are among its most “seasoned” members. Between them, they have served on the AATH board, completed the Humor Academy, becoming Certified Humor Professionals. Their pathway through the Humor Academy inspired them to serve as Humor Academy advisors. More recently, they created and became editors of the Humor Voice. In 1995, they developed a humor and health course which has now been “jesting” for over 20 years. They have presented keynotes and workshops at conferences as well as to major corporations and healthcare organizations. AATH is pleased and honored to recognize the dynamic duo of Laurie Young and Kay Caskey as the 2018 Doug Fletcher Lifetime Achievement Award recipients. Willibald Ruch is a Full Professor of Psychology at the University of Zürich, Switzerland where he chairs the section of personality and assessment. His research interests are humor and laughter, cheerfulness and smiling. He developed a taxonomy of jokes and cartoons and its relation to personality. Together with his team in Zurich his research includes humor from the perspective of positive psychology, the effectiveness of humor training programs and clown interventions, the ability to laugh at oneself, the fear of being laughed at (i.e., gelotophobia), and bringing gelotophobe-savy laughter to avatars. He developed several humor assessment instruments and published more than 280 research articles or book chapters and five books. He served as a Consulting Editor of Humor: International Journal of Humor Research, and has been the president of ISHS in 2002 and in 2012-2013. He is coeditor (with Victor Raskin) of the Humor Research book series. In 2001 he founded the annual International Summer School on humor and laughter, which is now in its 17th year. He is the founder and current president of the Swiss Positive Psychology Association, and IPPA (international positive psychology association) fellow (class of 2015) and member of the executive board. AATH members know Mary Kay Morrison as the Energizer Bunny of AATH presidents and the co-founder with Karyn Buxman of the AATH Humor Academy Certified Humor Professional (CHP) graduate studies program. It is hard to imagine a more hardworking, tireless, and persuasive (to get others to work hard, too) leader of AATH. On the professional side, Mary Kay's book, “Using Humor to Maximize Living” is the text for Level I Humor Academy students and for numerous college courses. As an educator, Mary Kay has taught at virtually every level of the educational spectrum: facilitating keynote presentations and workshop sessions for the past 30 years. She has written extensively on the top 10 benefits of humor. Her work on the links between neuroscience and learning can be found in numerous education publications. Humor articles by Morrison have been published internationally in countries as diverse as India and Brazil, and she was the featured speaker at a televised national education conference in Turkey. She has been a university commencement speaker; a guest on talk radio shows, and has served on various Illinois State Board of Education “train the trainer” teams. Although her long-term devotion to AATH is obvious, Mary Kay notes that her greatest joy is her family, including her husband Don, her children, and her12 beautiful grandchildren. Joyce Saltman is a professor Emeritus of Special Education at Southern Connecticut State University in New Haven, CT, she chose to receive her doctoral degree from Columbia, because she loved the color of their doctoral gown. It was no small feat that she was able to persuade her mentor to allow her to write her dissertation on “Humor in Adult Learning.” She also holds four graduate degrees in the fields of Special Education and Counseling. Joyce’s innovative teaching style has led to the development of a graduate course entitled. “The Enhancement of Learning Through Humor,” as well as a summer institute called, “Healing, Education Laughter and Play (HELP). Her experience in the areas of education, therapy and comedy has provided an outstanding background for her research on “The Therapeutic Value of Laughter.” Since 1983, when Joyce began lecturing on “Laughter,” she has been interviewed by national radio and TV. Her dynamic seminars and articles, always peppered with humor, address such topic as dealing with difficult people, laughter as therapy, parenting, and relationships. Her goal is to enlighten, educate and entertain while the audience laughs. Joyce has been speaking on “Laughter” and related uplifting topics since 1983, and hopes to be able to die laughing - but not too soon!!! As a result of her speaking engagements she has so far been able to donate over one million dollars to her favorite various charities. Intermittently referred to as the “Guru of Laughter,” and “The Chubby Broad from Brooklyn, Joyce helps people lighten up wherever she goes! In 2014, we were honored to present the Doug Fletcher Lifetime Achievement Award to Alleen and Don Nilsen. Humor scholars, Alleen and Don Nilsen, retired from full-time teaching in the English Dept. at Arizona State University in May of 2011. However, they have continued teaching a class in Humor across the Disciplines at ASU, and also in sharing power points and presentations to senior citizen groups in the Phoenix area. When they taught their class to Honors College students and then to students in the English Department, they laughingly admit that the students were teaching them more about digital humor than they were teaching the students about “traditional” humor. They used what they learned from their students to make Power Points on such topics as Digital Humor; Humor and Aging; Humor and Health, Humor and Gender Issues; and The Features, Functions, and Subjects of Humor. In 2013, we presented the Doug Fletcher Lifetime Achievement Award to Lee Berk, DrPH, MPH, FACSM, FAAIM, CHES, CLS. Dr. Berk is a preventive care specialist with research and interests in positive affect/emotions and their behavioral/biochemical/physiological/immunological effects relevant to the whole-person care through the medical science of psychoneuroimmunology. He is currently the Director of the Clinical Molecular Research Laboratory, Associate Director of the Cardiovascular and Physical Fitness Lab, Associate Professor in the Schools of Allied Health and Medicine and Faculty in Graduate Studies at Loma Linda University, CA, and non-resident faculty scholar at the Center for Spirituality, Theology and Health at Duke University. In addition to his research and teaching, Dr. Berk has been a longtime supporter of AATH and has given generously of his time as a presenter at numerous annual AATH conferences and the Humor academy. He has been a mentor and friend to so many of us in the field of applied and therapeutic humor. Steve Sultanoff, PhD., was the 2012 Doug Fletcher Lifetime Achievement Honoree. Steve is a clinical psychologist, university professor (Pepperdine), professional speaker, past President of AATH, and internationally recognized expert on therapeutic humor. With over 25 years dedicated to therapeutic humor, he has authored many innovative articles, including a new article that outlines the core human qualities essential for presence of therapeutic humor. His chapter Integrating Humor into Psychotherapy is published in the psychology textbook Play Therapy with Adults. Steve has appeared on STARZ, The Morning Show, Lifetime, and PBS and is frequently quoted in national publications such as Prevention, USA Today, Men’s Health,Women’s Health, Redbook, Forbes, and others. Over the past 20-plus years he has presented at many AATH conferences as well as professional conferences. Steve is known for his live presentations as well as online humor courses, and his web site (humormatters.com) provides a wealth of information on therapeutic and topical humor. We presented the 2011 Doug Fletcher Lifetime Achievement Award to Paul McGhee, PhD. A pioneer is the field of humor research, Paul is internationally known for both his own research and his work in helping both corporations and hospitals learn to put humor to work. With a PhD in psychology, he spent 20 years conducting basic research on humor and laughter before becoming a full-time professional speaker. He has published many scientific articles and 13 books on humor, including, Humor: The Lighter Path to Resilience and Health (2010) (which is being used as the textbook for the AATH Humor Academy, Level 2); and Humor as Survival Training for a Stressed-Out World: The 7 Humor Habits Program (2010). His training program has consistently proven to be an effective humor skills intervention program. He is currently President of The Laughter Remedy, in Wilmington, Delaware and an instructor for Humor Academy, Level 2. Doug Fletcher was a nurse, therapeutic humor advocate, and AATH member. Doug inspired people to come together and build a strong network of health and humor professionals dedicated to exploring and developing therapeutic applications of humor. Doug worked part-time as an ER and ICU nurse at Mesa Lutheran Hospital in Mesa, Arizona. Most of his attention, however, was focused on a nursing magazine he founded and published: The Journal of Nursing Jocularity promoted humor in the healthcare profession by publishing humorous articles and cartoons from nurses throughout the country. This magazine had tens of thousands of subscribers and was readily found in hospital "nursing-staff" rooms and/or "staff bathrooms" for all to read and enjoy. Through the Journal of Nursing Jocularity, Doug organized nursing conventions that were focused on Humor for Healthcare Professionals. These conventions were held throughout the country as well as on special "convention cruises". Doug was a co-writer, producer and a performer for Who's Got the Keys? . AATH and the world of therapeutic humor lost Doug in a fatal car accident May 1, 1998. AATH created an award to recognize and honor both Doug Fletcher and those whose work follows in his tradition. The award may be presented to one, two or more deserving individuals each year at the annual conference. However, the Awards Committee may also decide not to give out the award in any given year if, in their discretion, there are no deserving candidates nominated. The award can be presented to either a member or a non-member. The Awards Committee shall determine who receives the award(s). However, as a courtesy, the committee shall inform the board of their decisions, as financial factors may need to be budgeted. Self-nominations will not be accepted, although this makes us chuckle.